Pursuing a successful career while leading a balanced life can be a rewarding experience for new graduates if they stand up for their principles, Harvest Collier said during commencement ceremonies at Missouri S&T on Friday, Dec. 19, and Saturday, Dec. 20. 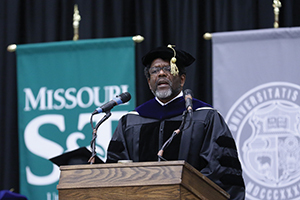 In his commencement address, the professor emeritus of chemistry and former vice provost of undergraduate studies at Missouri S&T asked the graduates to stand up for courtesy, integrity, perseverance, indomitable spirit and self-control. “With these principles being a part of you, you will be rewarded in many ways,” Collier said. Graduates who started as freshmen first heard Collier speak about integrity during Freshman Convocation. During commencement, Collier was awarded the Chancellor Medal, which is given to individuals who have contributed to the well-being, growth and development of the university.